Do you know what's worse than having a sick kidlet? Having two. Which is where we currently are. Awesome. But both littlies are currently sleeping off their cold/fever/cough thing so I am going to get in a spot of quickie gardening and a dash quickie crafting. Then some longie ironing. Quickie gardening first. Hurray for the sunshine!! 12-14 weeks and I hope to have something like this blooming on our front and back decks. Because in 12-14 weeks, it's going to be miserable winter to the maximum and some sweet floral tones will be much needed. 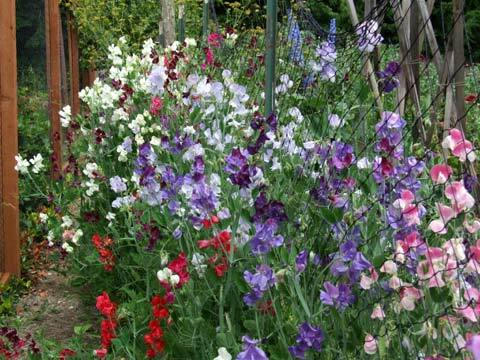 Enter sweet peas! And if you have 15 minutes and a plant pot spare, you could share in the joy. It's traditional to plant your sweet peas on St Patrick's Day (apparently seeds planted before sundown on St Paddys Day gives you the strongest, most prolific flowering plants) but all around Australia you can plant your seeds any time before Anzac Day, to give a beautiful show of winter/early Spring flowers. 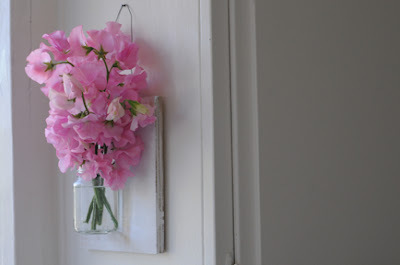 I have a few spare terracotta pots in the backyard that I'm using, but you can grow sweet peas in the ground, as long as the soil is rich and free-draining. They also require full sun (at least 6 hours a day). I picked up a few packets of seeds at Bunnings - they're Mr Fothergills - and they were about $3 a pack. One is a dwarf, and the other two grow to around 1.5-2m tall, so obviously need a trellis or some sort of support support. I bought some 1.5m bamboo posts from the local nursery that I'm making into teepees (check here for instructions) and have a good quality potting mix. Plant your seeds about one knuckle deep (roughly twice the depth of their diameter and water the soil. If the soil is damp when sowing, you won't really need to water them again until the seedlings emerge in a couple of weeks' time. *Gardening Australia suggests gently rubbing your seeds in some sandpaper and soaking them in some water overnight prior to planting, but I need a fix right now, so I'm popping the seeds in straight out of the packet. Tut tut, I know. As the seedlings emerge and tendrils start to grow, gently wrap the shoots around your trellis, to encourage the plant to grow upwards. And once flowers start blooming in 12-14 weeks, be sure to cut them regularly, as the more you remove the flowers, the more the plant will produce. And that means more beautiful, fragrant, ridiculously pretty blooms for your house. And your friends' houses. And your nana.